Heavy snowfall this winter continues to set new records in the hills around Oslo and throughout Southern Norway. At the same time, it’s prompting warnings against over-exertion when it needs to be shoveled away from both driveways and rooftops. Norway’s waterways and energy directorate NVE reported that there hasn’t been as much snow in the hills around Oslo, for example, since 1995. In some areas, snow depths haven’t been so large since the mid-1960s. There’s been at least 80 centimeters at low elevations this winter and more than a meter at higher elevations, with the hills around suburban Bærum, for example, reporting around 120 centimeters of snow on the ground. There’s also been lots of snow along the southern and western coasts as well as in the mountains and inland areas. 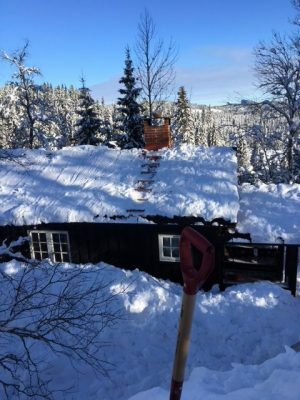 State broadcaster NRK has featured several incidents of hytte (cabin) owners arriving at their properties to find them snowed in, with a need to dig tunnels to the front doors. The amounts of snow seen around Norway this year rarely comes more than once every 10 years or so, according to meteorologists. Health officials felt compelled to issue warnings over the weekend, however, that shoveling all the snow can be dangerous for anyone with a heart condition. Heavy snow that’s piled up on rooftops, meanwhile, also needs to be shoveled, but carefully. Engineering advisory association RIF (Rådgivende Ingeniørers Forening) warned that all those who haven’t removed snow from their rooftops must do so to prevent them from caving in. “If snow has gathered throughout a winter and homeowners haven’t removed it, they risk limited compensaton or higher deductibles,” Øystein Løset of RIF told news bureau NTB.